miles) with over 10.000 m (32.800 ft) of elevation gain. They have to be finished within a 60 hour time limit, but they can also be ridden on several days for the Tourist category (with a minimum of 75 kms a day). These SR are supervised by Sophie Matter, who also organises the famous « 1000 du Sud », for the Audax Club Parisien, that organises the world known Paris-Brest-Paris. SR can be ridden in Australia, Austria, Brasil, Bulgaria, Canada, Croatia, France, Germany, Greece, Israel, Italy, Japan, Norway, Portugal, Russia, Slovenia, Spain, Taiwan, Ukraine, and the USA. Belgium added to the list in 2017 with its SR Team de Lux. Starting from Marche-en-Famenne, the route goes through Durbuy (the smallest town in the world) before leaving the Famenne to enter the Ardenne, with the Rideux pass (the only recognised pass in Belgium) and further Luxemburg with its Ardennes and small Switzerland. 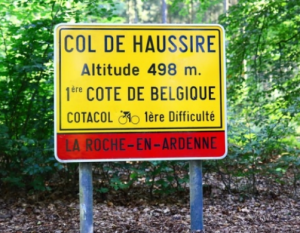 Then you will head to the German Eifel before coming back to Belgium via some famous hills from Liège-Bastogne-Liège (Wanne, le Stockeu) and la Vélomédiane (Haussire, Beffe). The ride is best to be done mid May til end of June,considering the blossoming grooms along the roads. 22 daring cyclists achieved it in 2017 : BERGUE Christian, BRICHANT Miguel, CASPERS Claire, CLAES Dennis, CLAESKENS Andy, De NIJS Daniël, DECKX Rick, DELBEKE Toon, DELOGE Jérôme, EECLOO Mathias, FIEREMANS Marcel, GEERTS Jan, GOEMAN David, GOMEZ Claude, LERUSE Francq, LERUSE Francq, MARNER Christoph, MOEYERSONS Bart, NIZETTE Alain, SCHMIDT Felix, THEUNIS Carl, TILLES Andreas, UWAROV Alexei, VELAERS Wout, WILLEMS Dirk. Last year 17 added to the list : BERGUE Christian, CLAEYS Christian, DE PELSMAEKER Steven, DE VULDER Patrick, DEMEULEMEESTER Jan, DEMONIE Peter, GOMEZ Claude, HÖSCHLER Peter, LERUSE Francq, MARIST Serge, MORENO Antonio, OYAERT Gérald, ROKITTA Timo, ROSOUX Pierre-Yves, RUTTEN Rudi, STEEN Piet, VENINGA Pieter, WILMART Yves.Finishers are from Belgium, Germany and the Netherlands. Hopefully other countries will come this year. The SR Team de Lux was the 3d most ridden last year (see the ACP ranking) !!! !